Taken from Rowan Brushed Fleece. 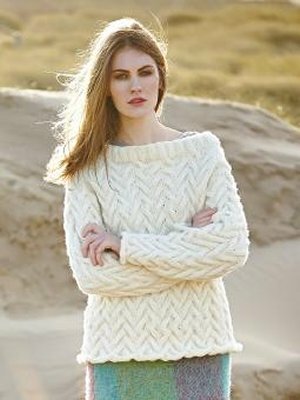 A wide-necked pullover sweater in an all-over cabled pattern and raglan sleeves. This pattern is from Rowan Brushed Fleece, pg 63 - Swale. Size US 10 straight and US 8 24" needles (or size needed to obtain gauge) and cable needle are required but not included. Gauge: 20 sts and 19 rows over 4". Color Shown is Cove 251. $175.50 -- Kit price including yarn only (no book or pattern). $193.45 -- Kit price including yarn and pattern book. $233.95 -- Kit price including yarn and pattern book.